There’s no doubt that burgers continue to go strong in the popularity stakes with customers, which inevitably means there is a lot of competition out there in providing the best burgers. So, if you want your burgers to stand out from the crowd, make sure they are the best! There is so much choice when it comes to what to put in a burger, from a classic cheese burger, to a crispy chicken burger or even a veggie burger option, but if you want to draw customers into your restaurant with the promise of a world class burger, there are three key ingredients you’ll want to start with. What even is a burger without a bun? Bread plays a big part in making a burger something special, if you choose mediocre buns, then you’ll end up with a mediocre burger. And no one wants that. While maybe in the past burger buns were a boring necessity, now with the abundance of different burger bun options you can really go wild and get your customers excited about the bread factor. The Tip Top Gourmet Burger Range includes everything from brioche buns, milk buns and their new addition, the potato bun. Brioche buns have long been a favourite and can provide that glossy gourmet look, for a lighter option restaurants can choose the milk bun route, but the up and coming potato bun trend is sure to really make its mark as a delicious burger bun option, with its light and moist crumb. It’s hard to think of any type of burger that isn’t made better with cheese, and like with burger buns, there is such a wide variety of cheeses, that you’re sure to find something your customers will love. Cheese can be such a versatile ingredient as well. It doesn’t just have to be a complementary ingredient, but instead could be the star of the show, for example, for your vegetarian customers you could use a piece of haloumi cheese in place of the meat component. Your vegetarian customers, not to mention the meat-eaters, are sure to love it. Tomato sauce, mustard, BBQ sauce, pickle relish, chutney, mayonnaise. There’s a sauce for every burger, and every burger should have some kind of sauce. Sauce can add some tang or sweetness, it can complement the whole burger and really pull the flavours together. It will also ensure the burger isn’t too dry. The sauce you include in your burger is what could really help make it stand out, so why not experiment with making your own signature sauce? It really is that simple – nail your bread, cheese and sauce options and your 5-star burgers will be sure to have customers flocking to your door in droves. 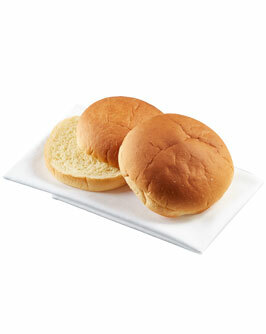 For more information on our range of burger buns head here.